It has been an adjustment period, to say the least, for a number of the world’s political leaders with the election of Donald Trump to what most consider the highest office in the globe. Taking over the foreign policy of the USA, the country with the largest military and the provider of $35 billion of foreign aid every year, is no small feat. The Oval Office does not come as a clean slate, with a number of existing deals and plans to contend with, which other leaders are worrying about the continuation of. This is particularly true of Australia’s PM Malcolm Turnbull who called last week to discuss his country’s refugee resettlement deal with the USA. It has been reported that prior to this conversation, Trump had expressed a desire to end this deal, according to Australian news. After the phone call, the New York Post reported, Trump stated “this is the worst deal ever.” A big question for most, however, is what is the deal? And if Trump scraps it, what are the implications for refugees? The deal concerns the resettlement of an unspecified number of refugees from Sri Lanka, Pakistan, Bangladesh, Iran and Iraq; the latter two were effected by Trump’s recent travel ban implemented by an executive order. The conditions of those refugees currently living in Australia’s off shore camps of Nauru and Manus Island is already in extreme question. Files released in 2016 show a distressing level and continuation of sexual abuse, emotional torture and self-harm often suffered by the camps youngest occupiers. These occurrences have even escalated in recent years despite repeated criticism from charities and the United Nations. The detainees America would have been taking have all been granted the right to refuge, however two phases of interviewing would still await them before the resettlement process even begins, which can take up to a year. Nauru has been described as Australia’s “refugee dumping ground” and the small hope these refugees had of finding new homes in the USA has now been called into question by the Trump administration. 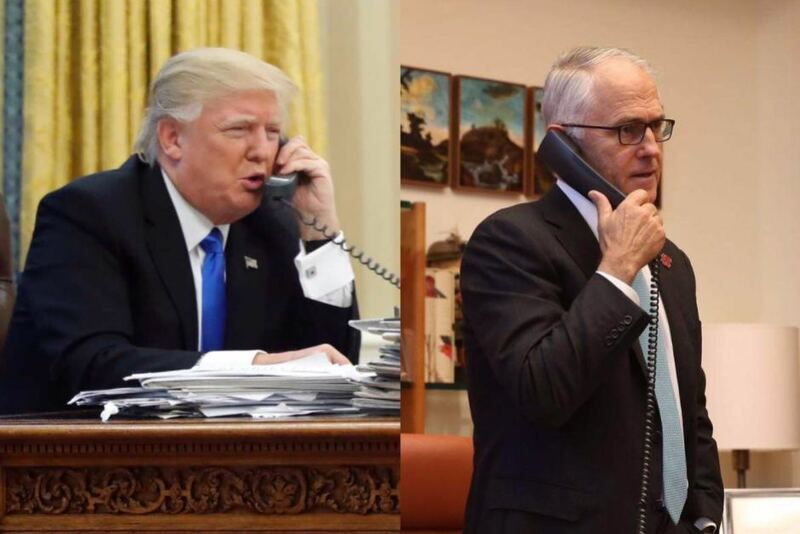 Malcolm Turnbull’s turbulent phone call with the unpredictable new leader of the free world has thrown the deal into disarray. Mixed reports from the US State Department and Australia’s government have attempted to confirm Trump’s commitment to the deal. However, the unpredictability of the business man turned President means governments and citizens alike struggle to know the future of this deal. Nothing has been confirmed since Trump stated, on Twitter of course, that he would “study this dumb deal.” But the focus should not be on this man or Turnbull as they struggle to please both the electorate and politicians, rather on the refugees fleeing conflict and war only to suffer in detention centres in a state of near unending legal and physical limbo. This deal is not a solution to the human rights abuses that are occurring in Australia’s detention centres or the use of detention centres by a number of first world countries as a jail for innocent refugees. However, this deal could alleviate the suffering of some and provide safety and a new life to those who desperately need it. Donald Trump’s Republican colleagues, including his own Vice President Mike Pence, often argue against abortions because every human life matters. Surely, this Republican held Congress, can recognise that refugee lives matter.